All HYDRO-BLOK shower pans feature high quality construction with a 100% waterproof XPS foam core, covered by fibreglass mesh for added strength, and then coated in a modified cement surface for setting your choice of tile, stone, glass or mosaics on. 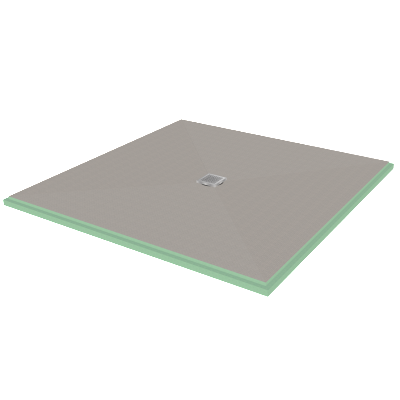 The shower pan has 4 equal flat slopes that allow you to lay tile as small as mosaics to full size tile. Make sure you pick up our HYDRO-BLOK Joint Sealant for the glueing of all seams and joints. Add any of our custom accessories to bring that added personal touch to your shower. For tile size 2” x 2” or smaller, we recommend using a higher compression grout such as epoxy or urethane for additional strength. Use this document to estimate the HYDRO-BLOK shower components & accessories required for standard installations.